Phillies Have Cheese Steaks – Tampa Bay Rays Cotton Candy? Well sports fans it’s World Series time once again. You’ve got the sweet smell of fried onions, peppers and steak coming from the east and the sweet smell of Cotton Candy coming from the south, huh? As I was trying to learn a little about the Tampa Bay Rays, I stumbled across this picture of a stadium vendor selling cotton candy through out the crowd at a baseball game in Florida. That really struck me odd considering, cotton candy can disintegrate with even the heat of your breath let alone the tropical Florida weather and sun. I’ve been to many professional baseball games in my life and I honestly can’t ever recall hearing someone yell ” get your cotton candy here”. I normally hear, peanuts, get your peanuts, or Ice cold soda, but cotton candy?… never, unless I’m at the circus! I can’t even imagine the sticky mess the sugar spun sweet treat could make as I sat watching the game in the Florida heat. It’s bad enough tramping thought the spilt soda and beer or those shelled peanut casings. Add a gooey sugar glazed candy coating to them, I’d be better off throwing out my shoes! I still couldn’t figure out how those Florida stadium vendors were selling that cotton candy outdoors at baseball games. Then I finally realized the Rays play baseball in a indoor stadium. That’s a double huh? Well… no matter who wins the World Series this year, you can be sure the Philly cheese steaks will be a plenty here in the East and I guess many down south will be making an extra trip to the bathroom to unglaze themselves from the cotton candy mess! No, I’m not hunting for Billy Joel, Billy Ray Cyrus or Billy Bob Thorton. I’m hunting for one of our dedicated candy employees, Billy Yoder. Billy has been employed by us for over 38 years. If you ever get the opportunity to walk into our candy warehouse or candy outlet store, you will probably hear one of us asking, or yelling… “Where’s Billy”. Billy is probably one of the most hunted guys within our operation. If you’re a new wholesale customer walking in, Billy is probably who would help you, if we can find him! Thirty eight years is a long time to be getting up and heading off to the same building everyday. Billy spends a great deal of time walking up and down our candy outlet aisles or warehouse making sure the candy bars are stocked, the lollipops are within an easy reach and the Holiday candies are in their correct spot. This week my brother, the company President, decided to make sure everyone including customers knew we were always hunting Billy. 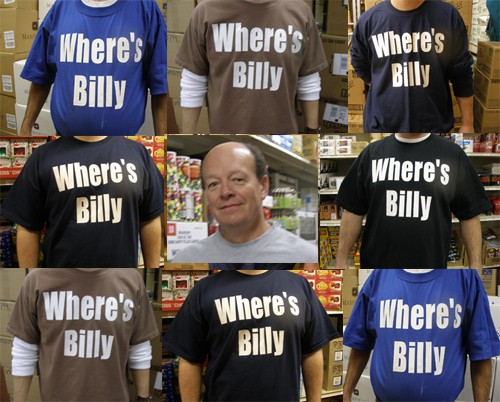 He had special T Shirts made up for all the employees to wear that stated “Where’s Billy”. It was probably one of the best jokes I have ever seen pulled off inside our building. Every year same time, I sit and watch our orders for the Clark Bar go crazy! It’s either a Politician running for office with the last name Clark using this Nostalgic Candy bar, or the family down the street named Clark using them for their Halloween candy treat and lets not forget the Mr & Mrs Clark handing them out to all their wedding guests as favors. This year I really see a spike with orders right from our own state of Pennsylvania. No, I don’t think we have a big election going on by someone with the last name of Clark running for office, but we do have a College starting quarterback for the Penn State Nittany Lions running his team down the field with 6 straight victorys so far! Considering, Blair Candy is just a Hail Mary pass from Beaver Stadium, home of the Penn State Nittany Lions, Yes I’d say that’s the reason! I can’t wait to see if I notice a touch of the sweet red Clark Bar wrappers in the famous white out crowd next home game. Would really make a statement. Blue and white school colors, add a touch of red, ahh Red, White and Blue! Now if only the last name Roethlisberger would be as easy to spell as Clark!